A modern metropolis set in the north of the island nation of Taiwan, Taipei serves as the nation’s major center for politics, commerce, mass media, education, and pop culture. Since the 1970s, the city’s eastern area has emerged as a bustling center of finance and commerce, and now features skyscrapers, wide boulevards and the Taipei World Trade Center. While the city embraces modernity, cultural traditions and arts continue to thrive and color daily life in Taipei, where concerts, festivals and other events are celebrated in full splendor throughout the year. The Grant Hyatt Taipei was my launching pad during my most recent trip. A government-sponsored economic stimulus package brought the rates down to NT$3600/night (~US$103) at this 5-star hotel. The hotel’s regular rate is NT$5500 or ~US$158 per night. Skip having breakfast at the hotel. Instead, head out to a street market just a few blocks away. This bustling area filled with locals picking up ingredients for tonight’s meal, here you’ll find fresh produce, meat, and a variety of sundries for sale. for about US$1 or NT$30, pick up a cup of hot soy milk and shāobǐng youtiao or chinese donut wrapped in roasted flatbread for breakfast. With breakfast in hand, make way toward the National Dr.Sun Yat-sen Memorial Hall. Completed in 1972, this landmark was in memory of the national founding father of the Republic of China, Dr. Sun Yat-Sen. In addition to serving as a place of remembrance, the hall contains a library with 1.4 million books as well as five large exhibition halls with various displays, capable of holding more than 2,500 people. Next head west on Jhong Xiao (Jhongsiao) E. Rd toward SOGO department store. This stretch of road is one of the major shopping area in Taipei’s east district. Here you’ll find boutiques presenting an array of brand clothes, jewelry, shoes and leather items. Today’s shopping ends at SOGO. Considered the shopper’s paradise, SOGO is Taiwan’s leading department store in terms of overall revenue and popularity. The next stop in today’s journey will require a ride on the MRT, Taipei’s subway system. Access the station entrance directly either from inside SOGO or right out front. Purchase 2 NT$20 single journey tokens (use one now, and another for the next stop on today’s itinerary) and hop onto the Nangang line in the direction toward Yongning. Exit at the Taipei Main Station and to the National Taiwan Museum. The oldest museum in Taiwan, the National Taiwan Museum was set up by the colonial government of Japan in 1908 to commemorate the inauguration of the North-South Railway. The museum had a collection of over 10,000 items in its initial stages. Today, the museum features specimens of Taiwan’s indigenous animals and plants as well as cultural artifacts. Its elegant architecture, abundant collections and unique geographical position have made the museum an important landmark in Taipei. The museum is open Tuesday through Sunday, from 10 a.m. to 5 p.m. with an admission fee of NT$20. Back to the MRT. With the remaining NT$20 token, hop on the Danshui line toward Xindian. Exit at Chiang Kai-Shek Memorial Hall. This famous monument was erected in memory of Chiang Kai-shek, one of the most influential leader in the history of the Republic of China. Enter through the imposing gates into the 250,000 square meter park that house the monument, the National Theater, and National Concert Hall. 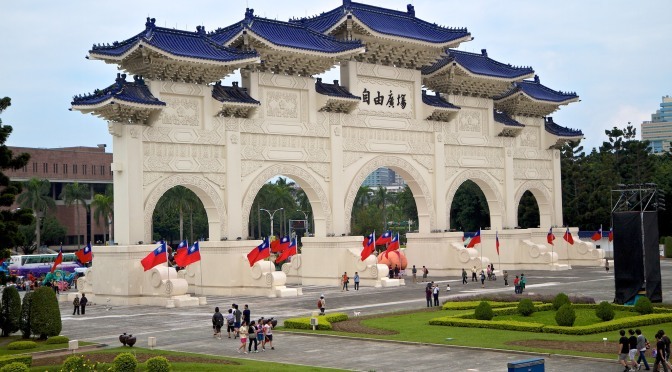 The CKS monument is the symbol of both Taipei and the Republic of China. The memorial consists of a large bronze statue of Chiang Kai-shek, watched over by two motionless honor guards who are replaced every hour. Downstairs, there is a museum of Chiang’s life, complete with his sedans and uniforms. Even if you are not into memorials, the gardens, with their Chinese style ponds, are definitely worth a visit. Take a taxi back to the hotel and rest up before heading out this evening. Authentic Taiwanese cooking is on the menu tonight. Popular with Taiwanese diners, Shin Yeh serves classic Taiwanese cuisine with a touch of Japanese influence. This is one of the only restaurants in Taipei that serves rice congee with sweet potato (a breakfast staple) at all hours of the day. You cannot go wrong ordering anything from the menu. Make sure to book ahead as the wait time for walk-ins can be long. Save room for dessert. The peanut powder covered mochi is not to be missed. After dinner, take a leisurely stroll toward the Tong Hua Night Market. One of the many night markets in Taipei, this one features food stalls plus more than 100 vendors selling clothes, shoes, accessories and other knickknacks. While not as large as the “must-go” famous Shilin night market, the experience is just as memorable.